And that nutter was ME 🙂 . 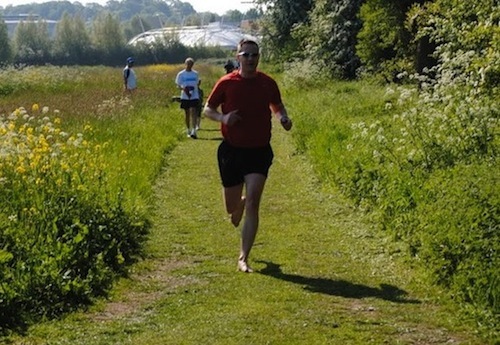 Yes folks, I have now technically done my first race in over 10 years and I did it barefoot. I opted for a mostly grassy 5k and it was fantastic. I've been contemplating doing the Reading Parkrun for a while now however have always been put off by the weather or the fact I had to make my decision to run by 6pm the night before. Not anymore. On Friday morning I heard the weather was due to be glorious this weekend, so I thought I'd register for the Parkrun this weekend and give it a go. Well, things have changed since I last considered doing the Parkrun as now you only need to register once, print off your barcode and take it along to ANY Parkrun in the country. No more pre-registering the night before. Just turn up, run, and flash your barcode when they register your finish position. Brilliant. So with myself registered and barcode printed, my wife and I got up early on Saturday morning and cycled down to Thames Valley Park. The weather was wonderful, as predicted, and there was quite a turnout. Apparently there were a record 115 entrants in yesterday's run. At 9am we were promptly started and things got off with a blistering pace. I somehow managed to get a little caught up in the excitement of it all and started off a little too quickly, but I soon settled into a comfortable pace and finished in a time of 20:09 - waaaaaay quicker than I was expecting. I was only aiming for somewhere around 23:00, so I'm chuffed to bits. Of course, I suspect a lot of my great time has to do with the fact that the course is mostly grass. There is a short section with a gravel path, but most of this has nice grassy verges so there's not need to continually run on the gravel. The gravel wasn't completely avoidable but I didn't really have any issues with the sections I couldn't avoid. All in all it was a great run and I'm glad to have done it. I think I may have to get my bare feet down there more often too. Oh yes, and for those who don't know anything about Parkruns, essentially they are free relatively informal timed 5k runs run in parks all over the country, open to anyone and everyone (provided you're pre-registered and got your barcode). Check out the about page for more details.